This year’s Super Bowl could just as easily have been called The Streaming Bowl. No fewer than seven subscription streaming video services advertised during the big game, all hoping to score with consumers after the football game was over. Among the streaming sponsors was YouTube TV, which served as the presenting sponsor for the Super Bowl pregame show. Immediately before the Super Bowl began, The YouTube TV Kickoff Show included YouTube TV branding in its graphics and voiceovers, and a long ad in the prime slot prior to kickoff. YouTube TV was the only streaming multichannel bundle to advertise during the game. During the game itself, Hulu, Amazon Prime Video, Netflix, CBS All Access and HBO Now all teed up new or returning shows. Instead, it was Amazon Prime Video that used the Super Bowl as a surprise launch pad for a new show. The service’s drama/action series “Hanna” has its launch trailer in the third quarter, with the trailer adding the first episode was available to view for 24 hours after the game. "Hanna" won’t be fully available for a few months. 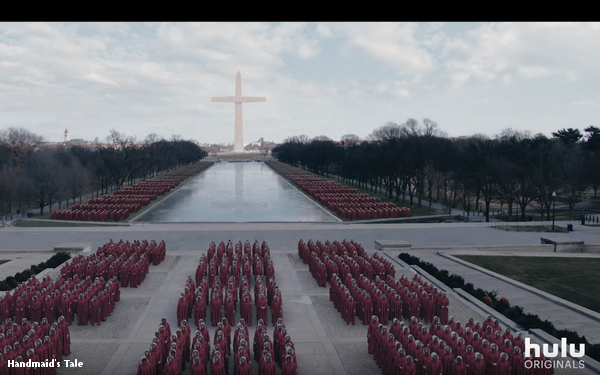 Hulu used the game to debut a new trailer for the third season of “The Handmaid’s Tale” early in the first quarter. Hulu bet promoting its biggest hit during the biggest game was the best way to have an impact. It was a strategy mirrored by HBO, which ran a subversive ad to promote the upcoming season of “Game of Thrones.” HBO had one of the most talked about ads by giving viewers the impression they were seeing an ad for Bud Light, featuring the mascot The Bud Knight. Ultimately, of course, a dragon from “GoT” killed the beer mascot. CBS, which broadcast the Super Bowl, used the game to promote two of its own streaming services. The company debuted the first trailer for its reboot of “The Twilight Zone,” produced and hosted by Jordan Peele. Showtime, which is available as both a streaming service and as a pay-TV add-on, was also the focus of a promo during the game. Even Scientology got in the game, running an ad in many major markets (though not nationally) promoting its streaming service Scientology TV. The influx of streaming services as Super Bowl advertisers is significant for a few reasons. First, it make the emergence of a new category of ad. Whereas the big game has historically been dominated by food and beverage companies, automakers, CPG and movie studios, streaming has joined the upper echelon of advertisers in terms of number of spots purchased. YouTube TV’s pre-game takeover was in a spot that historically would have gone to the biggest of advertisers. In addition, it marked a continued expansion of streaming services across the sports landscape. YouTube TV is the presenting sponsor of the World Series and the NBA Finals. Now it adds the Super Bowl pregame show to its list, while Hulu is the presenting sponsor of the Stanley Cup Playoffs and the NBA Playoffs on TNT.